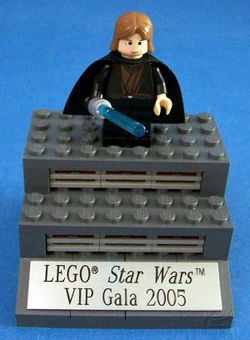 The Toy Fair 2005 Anakin Promotion was released in February 2005 at the Toy Fair as part of the LEGO Star Wars Episode III: Revenge of the Sith line. Included is one Anakin Skywalker (Episode III, Light-up, Cape) minifigure. This set was one of three Toy Fair 2005 LEGO Star Wars promotions, the others being Toy Fair 2005 Luminara Unduli Promotion and the the Toy Fair 2005 V.I.P. Gala promotion. This set was only available to those invited by LEGO to the 2005 International Toy Fair. Facts about "Toy Fair 2005 Anakin Promotion"
This page was last edited on 17 August 2017, at 03:17.